Skip O’Hara (William Traylor) is a New York City bachelor who has decided to give up his exciting, romance-filled lifestyle for a marriage to a woman named Joanne (Dagne Crane). When Skip gets called to work one night while he’s supposed to be going out with Joanne. While waiting for him to return from work, she stumbles across his diary, in which ponders the question of “Which witch will eventually steal my freedom?” Joanne learns through the diary that her dear Skip, who she thought she was in a committed relationship with, has been carrying on with a number of other women. 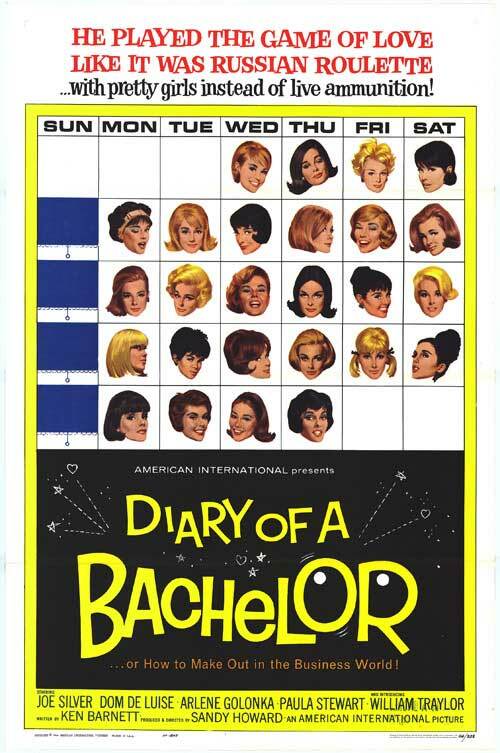 Released in 1964 by American International Pictures, Diary of a Bachelor was directed by Sandy Howard. The film marked William Traylor’s big-screen debut. He had worked in TV and had a few very small, uncredited film roles starting in 1954. After this film’s release he went on to appear in both films and television until his death in 1989. Diary of a Bachelor kicks off with a comical opening of a literally head-turning woman. Men walk into lamp posts, crane their necks and nearly fall over each other to get a glimpse of a blonde woman wandering down the street. That blonde has nothing to do with the story, though. We soon meet Skip and Joanne as they’re preparing to head out for the night. Skip gets called into work, and Joanne stays in his apartment… at which point she finds and begins reading his diary. Diary-style narration and flashbacks are used to convey what’s written in Skip’s diary, and we see little of Joanne until the end of the film, so it feels as though we’re reading the diary along with her and making discoveries about Skip’s past. As a result, Dagne Crane’s talents don’t really get a chance to show themselves. William Traylor as our bachelor, however, gives a solid and often very funny performance as we wander through his many complicated relationships with lady-friends. The film is also paced quite well. It’s generally fast-moving, dragging a tiny bit in the middle but redeeming itself by the end, and never truly becoming dull. From a fast-paced comedy about a bachelor and his romantic conquests one may assume that Diary of a Bachelor should be pretty racy. It’s not as racy as some other films of the time, and even in comparison with Hollywood’s major releases of the time, it doesn’t push extravagant boundaries. It does speak quite frankly to the changing attitudes young singles were having about relationships during the early to mid-1960s. The push-and-pull between a traditional path toward marriage and a more casual, noncommittal romanic life is very evident. The film doesn’t explore these issues too deeply though, remaining a light, pleasant and easy-to-watch rom-com that doesn’t take itself too seriously. It’s funny how so many of these ‘married/single men hot for women’ movies came out in the early sixties: Boys’ Night Out, Under the Yum Yum Tree, Who’s Been Sleeping in My Bed. I’d never heard of this one…I guess we can add it to the list as well! And what did Dom DeLuise have to do with it? Dom DeLuise plays one of Skip’s poker buddies who is uber-jealous of Skip’s luck with the ladies. As I child of the ’90s I remember him best for his closing remarks on the ‘All Dogs Go to Heaven’ VHS, so I didn’t even recognize him at first! I remember him from his ’70s comedies, most memorably with two he made for Mel Brooks. I never saw ‘All Dogs Go to Heaven’, but if I had, I’m sure it would’ve been on Beta!